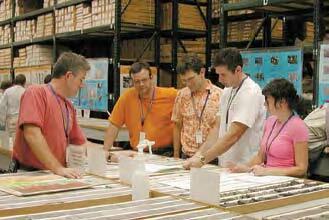 The Utah Geological Survey’s Utah Core Research Center (UCRC) offers researchers and scientists access to Utah’s most comprehensive collection of geologic specimens for petroleum- industry research, workshops, and short courses; thesis and academic research; and a variety of UGS/industry cooperative projects. Current holdings include core from more than 750 wells and subsurface samples from 3600 wells. Other sample collections include tar sands, oil shale, and type oils from all the producing formations in the state. The UCRC also maintains high-resolution digital imaging workstations, microscopes, and sample preparation equipment. In 2006, the UCRC hosted 20 industry workshops, five university classes, and handled over 100 requests for well information or geologic samples. Assistance was also given to industry and academic research projects of scientists from Utah, 18 other states, and six foreign countries. As a regional repository for irreplaceable geologic samples, the UCRC collection is ideally suited to supply and prepare samples for projects investigating the characteristics and economic potential of Utah’s oil and gas reservoirs. For example, the UCRC has a vital role in the current CO2 sequestration and enhanced oil recovery investigations in southeastern Utah. Core from Aneth field is being used to supply specimens for detailed reservoir studies, seal analysis and microscopic examination, and specially extracted core plugs are being used to determine the engineering and mechanical properties of the Aneth field oil-producing rocks. The UCRC is also participating in hydrocarbon investigations of the productive Leadville Limestone of southeastern Utah, the expanded development of deep and tight gas fields in the Uinta Basin, and the economic potential of the Navajo Sandstone from the recent Covenant oil field discovery in central Utah. From an underground core storage facility in Colorado, the UCRC recently acquired 3318 feet of core from six strategic Uinta Basin wells, that will give researchers a better understanding of the nature, distribution, and value of the Green River oil shale deposit.